But most books with a strong focus on meetings do not reveal this in their title. So the purpose of this topic is create a list of books which are essentially about meetings, even if they don’t state so explicitly. Just reply to add your reference (and feel free to mention even those that are more explicit about this.) Please give full references even if you provide a link. Schwartzman, Helen B. (1989): The meeting: Gatherings in organizations and communities. New York: Plenum Press. Please share your research articles! What do you mean by "effective meetings" or "meeting effectiveness"
Alvesson, Mats (1996): Communication, power and organization. (De Gruyter studies in organization 72). Berlin: De Gruyter. Alvesson analyzes an organizational meeting (labelled as an “information meeting”) from three theoretical perspectives: a cultural and social-constructivist approach (“The meeting as a culture-constitutive process”), Foucault (“The meeting as an expression of power and an occasion for discipline”) and Habermas (“The information meeting as a communicative distortion”). Another classic is, of course, the late Deidre Boden’s The business of Talk: Organizations in Action in which she uses Conversation Analysis to show how organizations rely on talk in meetings to get things done. Boden, Deirdre (1994): The business of talk: Organizations in action. Cambridge: Polity. The Interaction Order of Organizations. Conversational Procedures and Organizational Practices. Local Logic and Organizational Rationality. Appendix I: Notes on Transcription Conventions. 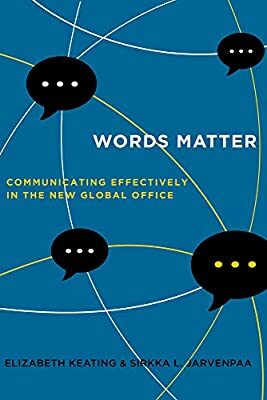 Keating, Elizabeth, & Jarvenpaa, Sirkka L. (2016): Words Matter: Communicating Effectively in the New Global Office. University of California Press. In this book, the authors translate insight from both their own and others’ research into hands-on advice for global office communication. I really liked how some surprising angles (such as swearing or joking) are used as an introduction for important theoretical concepts (such as the active role of the communication partner and establishing common ground). Reading the book helps you to become more sensitive to the (cultural) background of the people that you communicate with and applying the recommendations results in more effective distributed meetings and email interactions. Since no one else mentioned my book on this page I decided to do it myself: The title is Meetings, Manners and Civilization. The Development of Modern Meeting Behaviour. I wrote the original version in Dutch in 1994; the English translation / elaboration was published in 1999. An overarching theory of meetings? our book about Deliberative Transformative Moments (DTM) in deeply divided societies is indeed about meetings. We brought together ex-guerrillas and ex-paramilitaries in Colombia, police officers and locals in favelas of Brazil, and Serbs and Bosnjaks in Srebrenica. The topic for discussion was to find ways for a better culture of peace. We analyzed the conditions under which a discussion was transformed from a low to a high level of deliberation and also the conditions under which the opposite happened. The moderators remained passive and let the discussions go wherever they went. The main result is that participants themselves were often able to bring back a discussion from a low to a high level of deliberation. In this way deliberative leaders emerged. There were, however, also deliberative spoilers who were often responsible that a discussion lost its deliberative momentum. With this research strategy we get at the dynamics of meetings. Blob: “Cecilia E. Ford rejects popular notions of gender difference and even deficiency in women’s language use. She uses careful analysis of interaction to counter negative myths, focusing on women’s turns as exemplars of skills required by men and women alike to contribute to workplace meetings. Based on videotaped meetings in a variety of settings the author offers new insights into vocal and non-vocal practices for getting and using turns in these common workplace events. The book introduces conversation analytic methods and presents new findings on turn-taking, the use of questions to present challenges and open participation, and the interactional skills required to effectively raise issues that go counter to ideas of higher-ranking co-workers. Speaking Up in Meetings: Summary and Conclusions. Ford, Cecilia E. (2008). Women speaking up: Getting and using turns in workplace meetings. Palgrave studies in professional and organizational discourse. Basingstoke: Palgrave Macmillan. 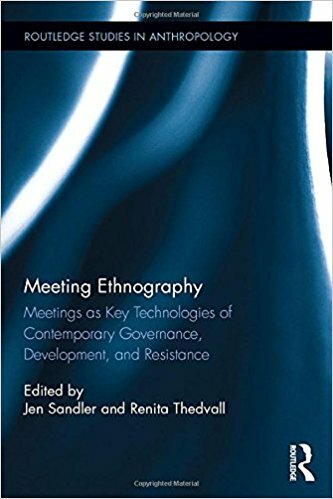 Renita Thedvall and my edited book is titled: Meeting Ethnography: Meetings as key technologies of contemporary governance, development, and resistance. This project focuses on comparative inquiry into the role and nature of meetings in different places and types of projects. Through July, this link should provide access to browse the whole book online. Check it out if interested! Do you want books from practice and popular business writing too? Or is this just about the academic literature? Good point. I was thinking that too, when I saw your long list of meeting handbooks on Amazon the other day. Why don’t you start a new topic with meeting advice books and we keep this topic to descriptive books? Nonprofit Organizations: Creating Membership through Communication published by Hampton press in 2009 is another book that is based exclusively on data generated from board meetings where I was a participant/observer. Drawing upon EC, EM and MCA, I take issue with previous research about organizations that does not focus on talk (similar to Boden and Schwartzman). Talk at Work: interaction in institutional settings (1992) Drew & Heritage. Not so much about “meetings” but about how talk happens in all sorts of work settings, this is a classic in the field of interaction studies and conversation analysis but it might be of interest to some curious about other aspects of talk at work. Talk at Work: Interaction in Institutional Settings (Studies in Interactional Sociolinguistics 8) edited by Paul Drew and John Heritage. New York: Cambridge University Press, 1992. 580 pp. Cooren, François (Ed.) (2007): Interacting and organizing: Analyses of a management meeting. Mahwah, NJ: Lawrence Erlbaum. Blob: "This work provides an exceptional case study, shedding light onto the functioning of an actual corporate board of directors. It presents analysis of a series of corporate management meetings shown in the 1974 documentary film, Corporation: After Mr. Sam. The film chronicles the discussion and communication processes as a company considers how to replace its president, and it serves as a unique opportunity for analysis of real-world organizational discourse. With an impressive list of prominent contributors, Interacting and Organizing: Analyses of a Management Meeting employs the dual perspectives of organizational communication and language and social interaction (LSI) to examine the film. It is arranged around specific topics, analyzed separately by organizational communication and LSI scholars. Editor François Cooren provides an introduction for each topic, and a comparison and synthesis conclude each part. Readers will appreciate the information presented, as it is an arena typically off-limits to outside eyes. The transcript of the film is included as an appendix to the volume." Part I: Leadership and Speakership: Which Voice Matters? 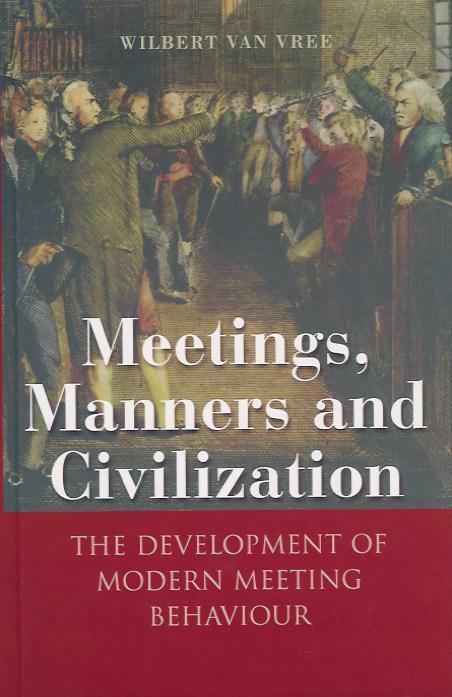 The title is Meetings, Manners and Civilization. The Development of Modern Meeting Behaviour. @wilbert I am finally getting around to reading your book and am finding it delightful! I’m about halfway through. It’s very frustrating for my husband because he’s trying to read a new fantasy novel page-turner and I keep interrupting him to share some fun new tidbit from your book. When I’m done, perhaps we can schedule a video interview? I’d love to share some of these stories with our community. I think the historical perspective is super useful, especially for our clients who struggle with parliamentary procedures.